Katie Can Too! 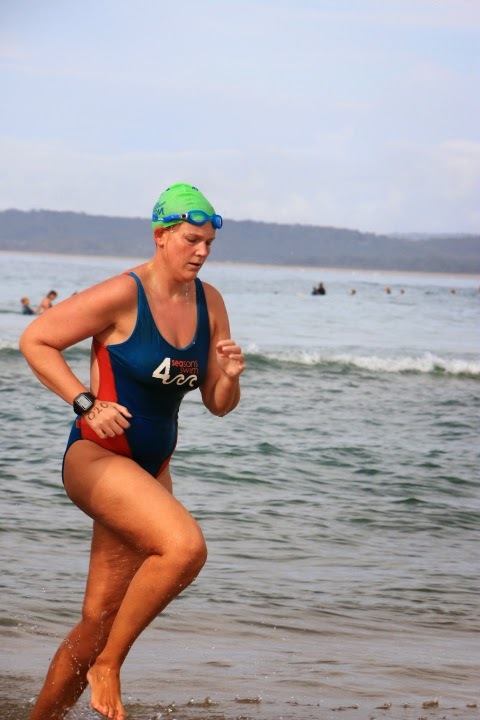 : Narranderra 10km swim. The big one. 10km. 5 x 2km laps up and back of Lake Talbot – a flooded creek outside of Narrandera. Bondi to Watson’s is nominally list as a 10km – but I don’t know anyone who has recorded that distance. (I understand there are insurance implications for owning the actual distance) Nonetheless great to get an official 10km swim under my belt. There are exactly 4 x 10km swims in the entirety of NSW across the entire open water swimming season (October – May). Only of one which gets a featured spot on oceanswims.com (Bondi to Watson’s). One is an obscure Penrith swim in November that clashes with a featured 5km (Umina), one is the Vladswim organised laps of Balmoral at Christmas (both of which clash with Can Too) and the other is Narrandera. 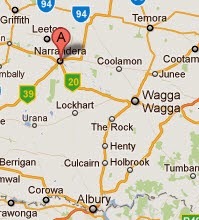 A tiny town an hour to the west of Wagga Wagga. Having said that, demand for these swims isn’t exactly huge either. Despite there being no boat or paddler requirement (the swim provided paddlers for you) there were exactly 5 swimmers doing the swim. 4 from Sydney and 1 from Dubbo. The race organisers knew our names, ages, and everything was exceptionally well organised. We were paired with paddlers, who set up our feeds (feeds!! luxury! ), herded down the astroturf lined steps into Lake Talbot to start bang on 9am. First lap, everything feels tight and I realise I’m in trouble having gone out too hard at the 1km Wollongong swim last night. engage core (crucial in flat, fresh water) to ensure buoyancy (your arse should be in the air, wiggling around like it just don’t care) and reduce the drag of your legs. Needless to say, on occasion, this all went to crap. But this is what keeps me occupied for most of the long swims. Chloe McCardel, legend long distance swimmer whom I met at a university debating tournament in 2004 when I printed her swim schedule for her, was once asked what she thinks about when swimming. Music? World Peace? She replied she’s too busy thinking about her stroke. What her head, arms, body and legs are doing. That endlessly repeating check list is absolutely the best way to pass the time. Despite everything being tight from the get go, it never descends into pain and on occasion it actually feels good. The water is more transparent than Cohuna last week but I still can’t see my Garmin in the water so I’m reliant on my distance alarm to tell me when to feed. I feed every 1.5km. Ordinarily you’d grab your bottle, roll onto your back, take a few sips and swim on. The lake is so short you can stand for feeds. It takes me about 4 goes to work this out. Not exactly Channel rules. I change paddlers 3 times over the course of the 3:52 it takes me to swim 10km. Each time they are just so encouraging and lovely. They’ve never met me and volunteer to support the town’s Riverina Rush sports festival. Amazing. Round and round we go. Luckily the lake is surrounding by beautiful bushland which gives you lots to look at. Sighting is incredibly easy in the flat water and with the rainbow umbrellas of the pool complex behind the buoys at the far end staying on track is pretty easy. On the third lap I am lapped by the leader, who turns out to be the only other female in the field. What a great way to celebrate International Womens Day! She later tells me I looked more relaxed than any other swimmer she’s ever seen. Out for the equivalent of a Sunday stroll / swim. By 7km I’m yet again, feeling fine and stronger than throughout the race so I start putting the hammer down. The entire 8km up to the turning buoy I inch towards the next swimmer ahead of me. He swims incredibly wide (my coaches were all in my head emphasising the importance of sighting and being thoroughly vindicated) whilst I swim straight as an arrow. He stops to feed at 9km (having only fed twice in the race). The best advice I have received is feed early, feed often. Those feeds you don’t feel you need in the early stages really pay dividends towards the end. So I skip my feed. He again swims wide and I catch him, with a 20m buffer as he needs to straighten up. And I fly home. I struggle to stand up on the steps though. 10km is a bloody hard slog! Presentation ceremony. I get to stand on a dias! Who saw that coming? And then there was a lot of watersliding at the super cool waterslides of the Lake Talbot Pool Complex. We backed it up with the Broulee swims the next day. Awesome swims and awesome road trip!